Held on Saturday (August 24, 2013), this two-part challenge will test the CAD and design skills of four jewelers. For the first challenge, the four participants will receive a detailed request for a design from a celebrity designer. Then they fire up their systems in hopes of best filling the designer’s needs. Judges will score them on their presentation, sales skills and how well the design meets the request made by the celebrity designer. Talk about pressure! 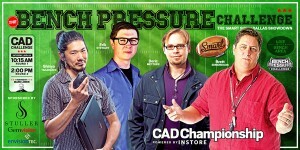 For the second part of the CAD Pressure Challenge, the same four CAD artists will be given design requirements to create an item in their own personal style. Each artist will be given two hours to unleash their own vision and creativity in this challenge session.